If my mantle looks familiar, you've seen it before with the paint chip Easter egg garland, which was inspired by Modern Parents, Messy Kids. I'm writing up my own tutorial on this one, since I used a sewing machine instead of doing it by hand. I realized recently how much I dislike sewing by hand! 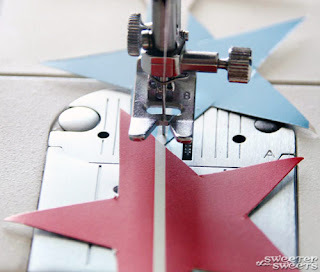 If you've used a sewing machine, you should be able to do this project since it's just a basic straight stitch. If not, do it by hand and it will be just as cute! I used 21 paint chips total, 7 of each color. Don't worry if some of the red paint chips look pink--you will get the overall look of red, white and blue when it all comes together. 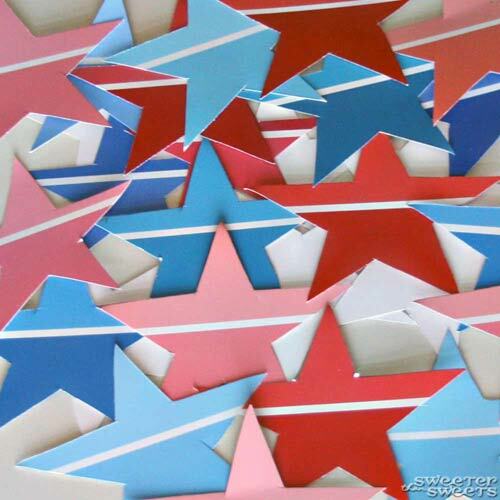 First you want to make yourself a star-shaped template out of your piece of cardboard. I traced one of Little Sweet's star shapes from a foam puzzle, then tweaked the size a bit to fit 2 stars on each paint chip. You could also draw your own or print out a star shape from Photoshop. Trace the star shape onto your paint chips and cut out as many as you want for your banner. Okay back to work. It's time to sew now. I had more red and blue stars than white so I used a pattern of red-blue-red-blue-white, repeat. There are a couple of ways you can sew these together as far as the spacing goes. I tried both and you'll see my results in a minute. The first way is to line them up right next to each other as you sew so they're close together and overlapping just a bit. Or you can leave a small amount of space in between each star as you sew so they're more spread out. You don't want the gap to be too big because it will be more likely that they'll flip upside down when it's hanging. I think I like the spread-out look better but the side that I made close together was definitely easier to hang. Can you see the difference? 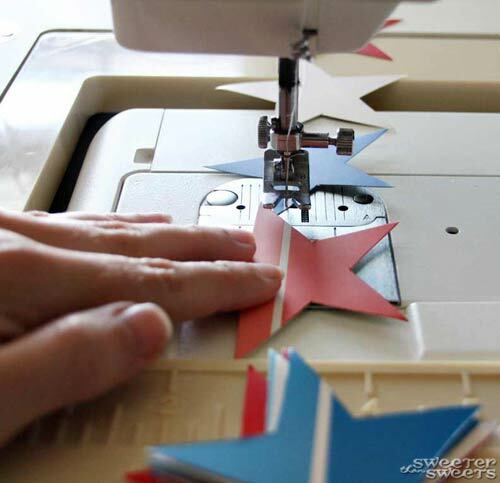 While you're sewing, be careful how the already-sewn stars fall since you don't want a big jumbled mess when you're done. 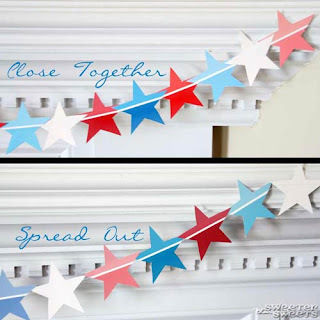 Then find somewhere to hang your Star-Spangled (Paint Chip) Banner! So festive and easy to make. This is a quick 1-naptime craft for all you mommies out there! 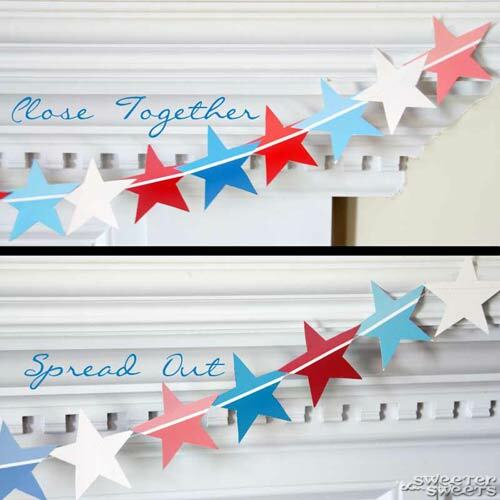 Think about all the possibilities with this craft: You could make stars to hang above baby's crib as a mobile (double-sided so the backs are pretty too), decorate a birthday party table in your theme colors (sewn together as a banner or just as giant star-shaped "confetti")... so many options. I'd love to see your version if you make one--leave a comment with your link if you blog about yours! 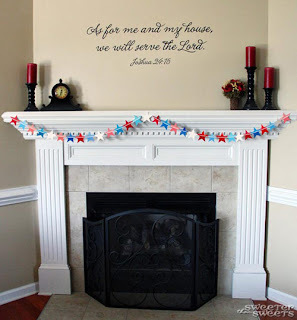 I LOVE the paint chip star garland!!! I love making things out of paint chips. Really nice! Stopping by from "A Glimpse Inside". How fun! I love how it can be made with a quick (freebie) trip to WalMart and things you've got in your stash! i love this idea... such a fabulous use of paint chips!! What a great idea! I'm following you from the Etsy Blog Team! This is way too cute! I love all these paint chip projects but I always wonder if you left any chips left at the store after you took them all! lol Thanks for linking this up to this week's Catch a Glimpse party. I'll be featuring this tomorrow. Fun idea! What a great way to upcycle paint chips!! this is fabulous! i'm sharing it on my facebook page! This is so freaking great! This paint chip stuff is killing me. I need to steal a million in a million different colors. Home Depot must be hating us! I just pinned this... I love how bright it turned out. great idea ~ love the look of this!! This is a really cute idea, Tricia! I love the different shades of red and blue. It looks great on your mantel! How Cute! i'd love for you to share it at my link party. Love the idea! So, so cute! It would be adorable for a birthday party as well. Great idea and great tutorial! I will for sure have to try this for the holiday! Thanks for sharing! This is such a cute idea. I love how simple it is...and free! Beautiful job. Very cute!! What a wonderful idea!! Awesome! I was going to by a craft punch until I saw that you made your own template. Hello! 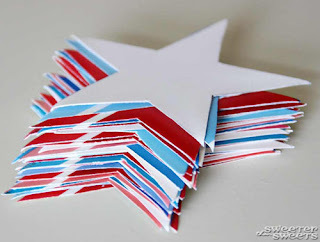 This is so adorable and perfect for Independence Day! I love it! I think I might find a star shaped punch to cut out all those stars though. Yours looks really great. Out of curiosity, do you buy your paint chips or are you encouraging us to all go to the hardware store and simply take paint chips for paint we never intend to buy? Good idea, though I think it may open up a can of worms when you think about where the supplies come from. What an amazing idea! 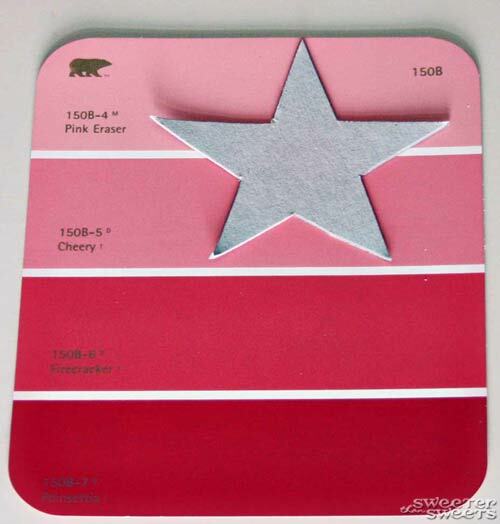 I'm certainly heading to Lowe's to pick up some paint chips over the weekend! Hope mine turns out as great as yours did! 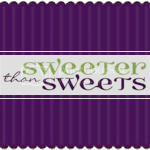 Great blog-I'm a new follower! 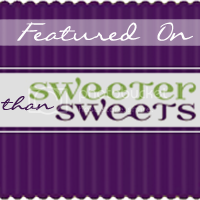 I featured this over at Sassy Sites! Thanks so much for linking up to our Sassy Summer party!! I love this! I love how this came out!!! Thanks so much for linking up to Delicately Constructed Fridays last week! Check out my blog tonight, I am going to feature this!! I am having a Red, White and Blue Linky Party and I hope you will join in on the fun by sharing this link. This turned out super cute and congrats on being featured! 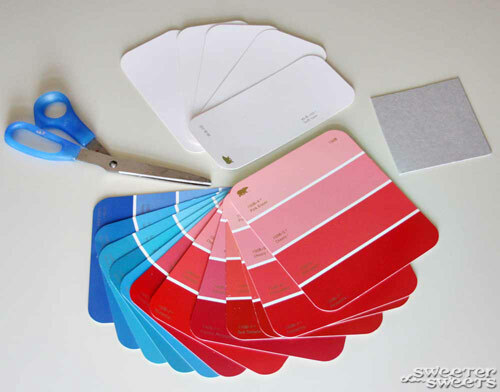 Btw, let "Annonymous" know, if you figure out how, that I called Lowes and asked them if I could come pick up some paint chips for a craft and they didn't seem to care one bit! So all you have to do is ask, no reason to be deceitful :) congrats again on another super cute idea and for inspiring us all! I don't sew but am thinking about making this into a craft with my daughter! 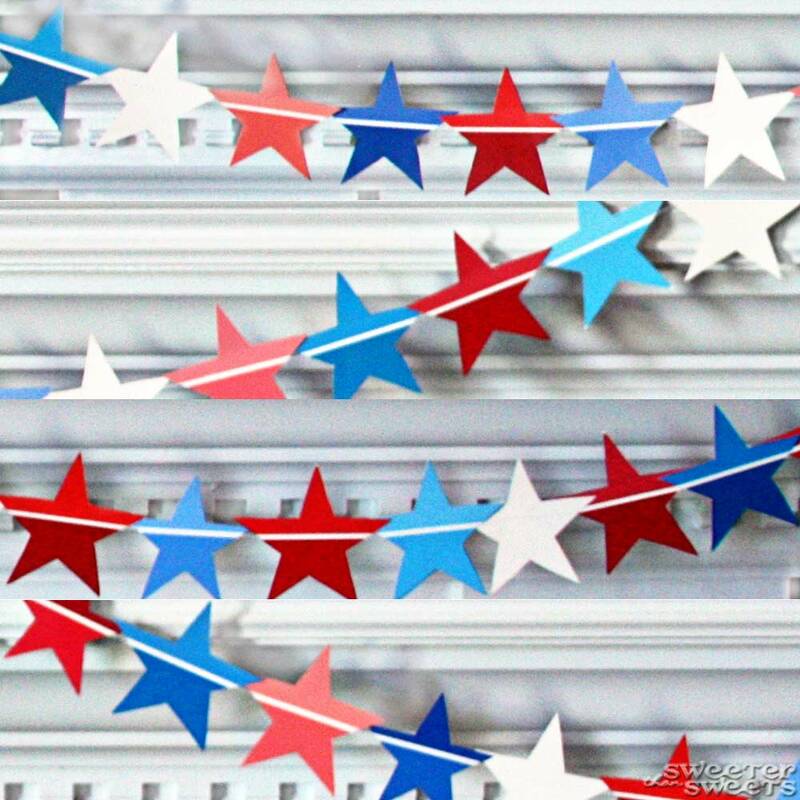 Did you use those stars on the 4th of April? It would be so patriotic to redesign your house for the Independence Day, I'm sure your guests loved it.